This past weekend I did the grand 'meet the boyfriends parents'. Over Thanksgiving, he met mine (and most of my family) so I guess it was time to do the same. All in all it went over well! Both his mom & dad are super nice & fun to be around. We played a few games (a giant game of Settlers of Catan since I bought Zach the expansion for his birthday), ate a yummy home cooked meal, watched a few movies, went out to eat, etc. They ended up going shopping & exploring one day, too. It was a great meet & greet. 10 points for first impressions! 1. You're not good enough - on the drive over to his apartment, the restaurant, or his parent's house, make suer you convince yourself you're not good enough. Remind yourself that you can't carry on a conversation, you aren't that smart or that witty, your laugh is a bit annoying and that your just plain not good enough. 2. You are clumsy - continue to think that durring dinner you will either drop the food on your fork, spill your drink, or drop the dish holding the casserole. Remember that you're fingers are made of butter. Because of this clumsy trait, you will also fumble over words. 3. You will have something in your teeth no matter what you do - durring dinner you will acquire something green in your teeth & it will not go away. No one will tell you & durring your speech about your career accomplishments, they will only stare at your dents. 4. They won't like you - right off the bat you should know that they will hate you. You are dating their son & they won't like it. 5. Let your imagination run wild - anything that can happen, will happen. The key to meeting the parents is to not follow these at all! While parents' opinions are important...if you & your guy are a good match all that matters is that they know you make him happy. It doesn't help to be a bit witty and hold a great conversation...but you are already awesome if you are reading this blog! How do you handle stress? 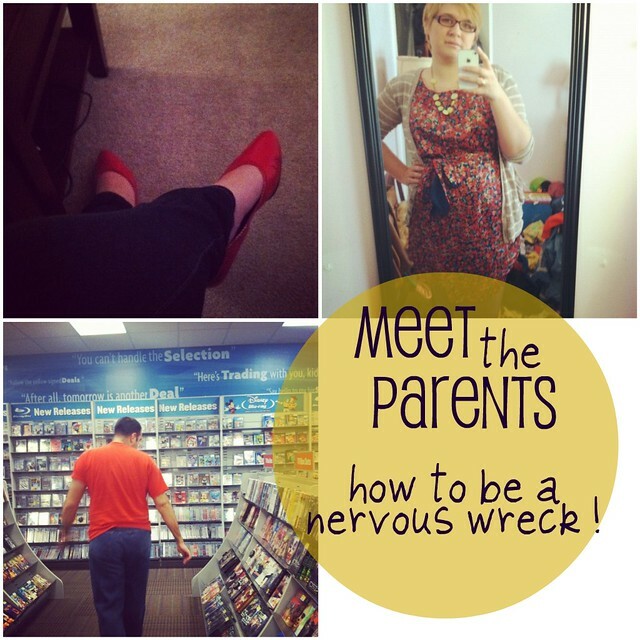 What happened when you 'met the parents' for the first time?